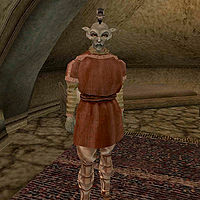 Dravasa Andrethi's is a Dunmer pauper who can be found in his house by the temple in Ald'ruhn. There is a copy of A Dance in Fire, Chapter 7 in his house. He is one of the sleepers, and can be saved by killing Hanarai Assutlanipal in her house in Ald'ruhn. If you ask him about the "Sixth House" afterwards, you will earn a point of Reputation. Dravasa wears a common shirt with matching pants and shoes. Aside from his natural resistance to fire and the sanctuary provided by his ancestors, he knows no spells. The apostrophe-'s' at the end of his name actually appears in-game for some reason. A minor mix-up by the developers. This page was last modified on 23 December 2014, at 00:04.